If I had to tell you my favourite thing about autumn, it would probably be the makeup transition from light, to deep and vampy - especially when it comes to lipsticks. 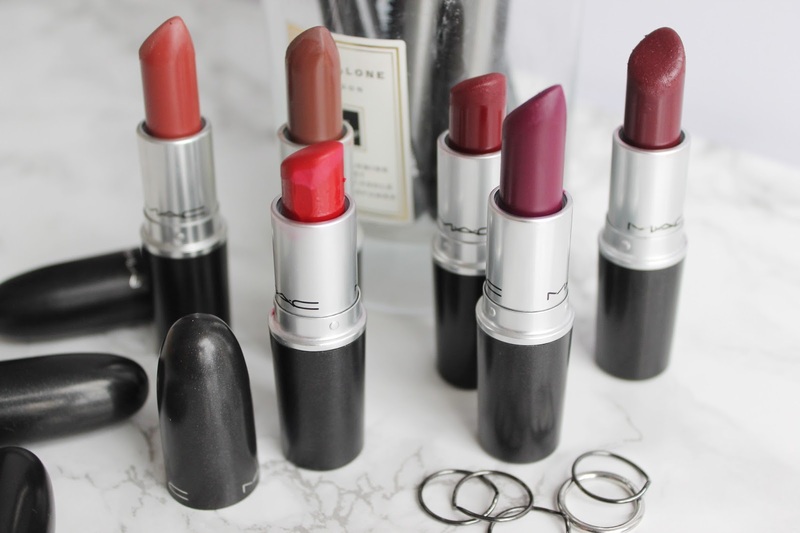 I've been a lover of all things lipstick for as long as I can remember, and I still even recall the day I received my first ever MAC lipstick - aged 11, christmas day. So to keep in with my own little tradition of Mac and festivity, I thought I'd give you the lowdown on my lipstick loves for the autumn/winter season. As you can probably tell, there's a running theme with my lipstick picks - dark purple anyone? But, even though the majority of these lipsticks share something in common, they are in fact very differing shades and I love them all for their own reasons. Let's start with whirl shall we? Whirl is one of Mac's more recent releases and was originally made famous in lip liner form for it's 'Kylie Jenner Lip' capabilities. 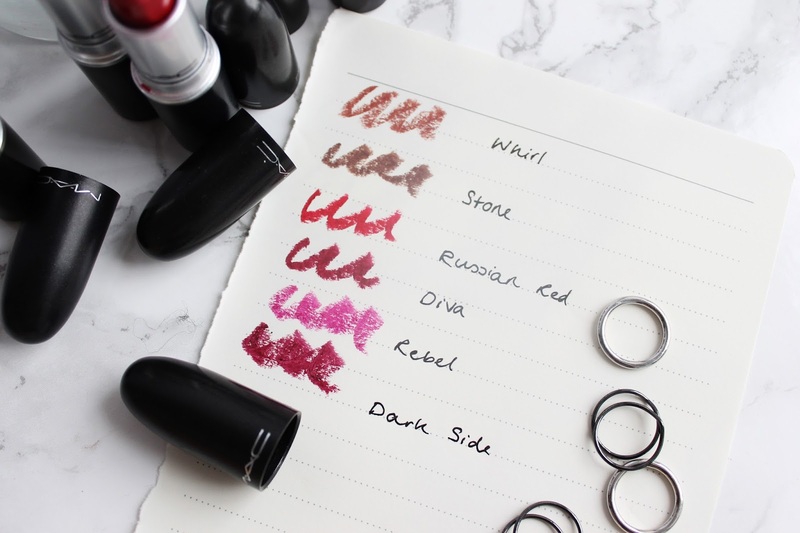 I've never actually tried the pencil, but whirl is the perfect dark mauve pink shade, great to transition your lip looks from summer to autumn in style. Stone, similarly to whirl, was released in the same collection and was originally a lipliner. I couldn't do a lip favourites and not include a greige now could I? I LOVE this shade, its matte, but not 'my lips are falling off they're so dry' matte. Russian Red is probably my all time favourite Mac red, I used to be an avid lover of Ruby Woo, but that shade gave me waaaay too much dryness on the lips and it wasn't comfortable to wear at all. Russian red gives you that incredible christmas shade, without feeling uncomfortable or drying - it's a staple. Diva, Rebel and Dark Side, are my purple loves. They all have a berry tone running through them, but they're all different in their own special way. Diva is an extremely matte wine colour, this was one of my first lipstick's ever and it's been in my collection ever since. Being a matte, it's still however comfortable to wear, and has amazing staying power. Rebel is a true purple grape colour, I don't get as much wear out of this as I'd like to, but with a winged liner and a poppin' highlight you really can't go wrong. Last but definitely not least, I present to you Dark Side, Diva's more glossy older sister. With an amplified finish that gives you the most beautiful colour, this shade is one of my all time favourites for a vampy, true winter style makeup. So those are my picks for autumn winter..
the whirl lipstick looks amazing. i have the lip liner and i need the lipstick in my life. It's such a lovely shade, perfect for the season! i need to get more mac lipsticks, stone is one of my faves! Love a bit of stone! diva looks extremely gorgeous, also your handwriting is insane! Oh gosh I hate my handwriting! thank you! all of these lipsticks look amazing! think i want the stone one, looks so nice! Whirl and Stone look like perfect neutrals! I'll need to look into those :) I've been loving the nudes lately and I've been reaching for NARS Barbara and Bite Pecan! Lovely collection - I really want to add Rebel to my collection!